Fungeon Party is a hectic party game meant to be played with a bunch of people. There are a variety of different characters to choose from, each with differing abilities, as well as many, many quests. Quests are flipped over — forcing you all to work together, or work against the party member in charge of the card, to complete these bizarre challenges. A specific number of quests make up an entire dungeon and you only have a few minutes to get through as many quests as you can successfully. If you start failing quests or don’t get through them, you will fail the dungeon and take some damage. There are a lot of pieces in this little box! So much so that once you have opened everything, you can’t really fit it back in the box. Fungeon Party contains 7 different character cards (despite being a 2 to 5 player game) each with 5 colored dice to match them. You also get 5 wands, one for each player in the game as they are magical creatures. A huge stack of Quest Cards dominate the box, as well as a bunch of life tokens, check mark tokens, and XP tokens. 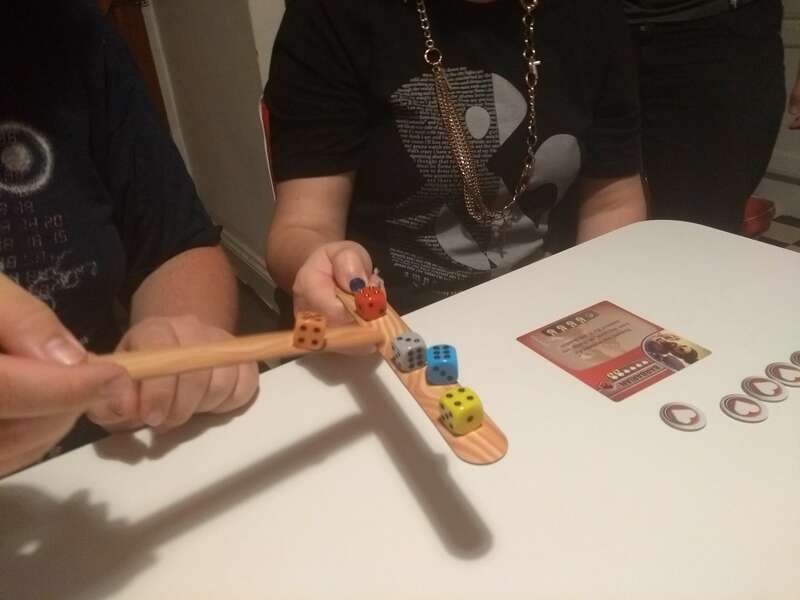 Five black die and a meeple also are there for quests related to meeples and bonus dice. Oh, and you get a rulebook of course. Once everybody has picked their character and learned their abilities, you will set up the dungeon. You can put at least 6 quest cards face down on the table — but for more challenge you can add more. Once you have your lives and special check mark token (which lets you use your ability), you are ready to take on the dungeon. Set a timer for 30 seconds times the amount of quest cards you have in your dungeon. You will have this amount of time to complete all of the quests and win the dungeon. Once you flip over the top card of the dungeon, you will need to start the timer and begin conquering the quest. Each dungeon card has a different character as the lead of the card. That character will read the card and make decisions related to it. If none of the players have played the character listed on the card, you must quickly decide who is taking lead. 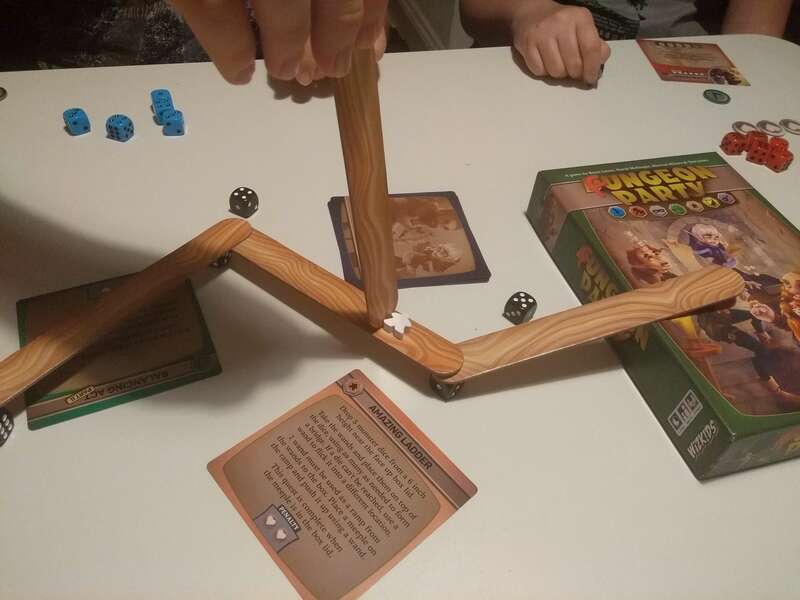 These quests are quite different -—from balancing dice on your head to making bridges with wands — you will need to do a lot of wacky things quickly. 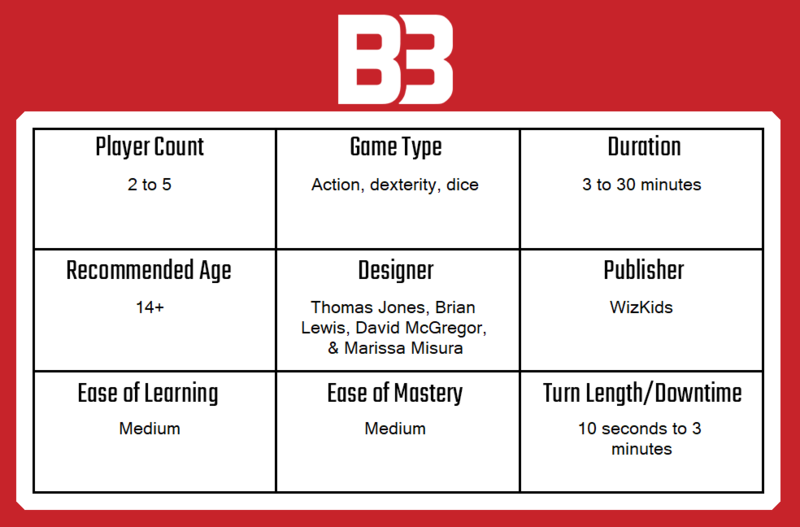 You might need to hide a dice in a room while the others look for it, or solve some math equations in the dungeon card. If you complete a quest, you can place it aside, however if you fail a quest by not completing what it wants, your party will take damage. As a team, you all get to distribute damage as to keep all of you alive for as long as possible. At any time, you can also use your abilities (though you can only use it once per dungeon). These abilities will really change how the game is played — from making dungeon quests easier to allowing you to skip portions of the dungeon without any damage taken. You will really need to remember you have these. Once all of the dungeon cards are done, or the timer runs out, the game has ended. If there are any current quests in play, this ends in failure. You will then gain experience points that you can spend to upgrade your characters as well as take any damage that you need. Fungeon Party is a very hectic and fun game. It is silly, has a large variety of quests, and is entertaining to watch. I feel that you could scale up the game to allow for more players — as there are already a bunch more characters than needed. I find that the more players you play with, the more fun the game is! A lot of the challenges force you to work together, which adds to the manic fun. You need to work very, very fast to actually complete the dungeon. We ended up stopping the timer between Quest Cards to read and understand the goals of the cards before starting the timer and resuming. With that in mind, there are a lot, I mean a lot, of Quest Cards. Having just a dungeon of 6 cards means that it will take ages to get through all of them. There are also a lot of cards marked Part II — and I have no idea why or if I shouldn’t include them in the first time I play the dungeon. I just treated them like normal cards when I played the game. Fungeon Party is a really fun game. Once you get into the mindset of being fast, reading cards quickly, and understanding your character’s ability you can really get into the game. You do need to have a large area to play the game in — it seems to be built for a large American living room so that people can move about and solve some of these quests. Some of the Quest Cards don’t quite make sense to me, nor does the descriptions of how the game’s box needs to be placed for some quests. I feel that several of the cards could be condensed as to take up less time when reading, but there is such a good variety of quests for you to take on anyway. Fungeon Party overall is indeed fun, although we did change the rules a bit to make it more fitting to the group of people we played with. 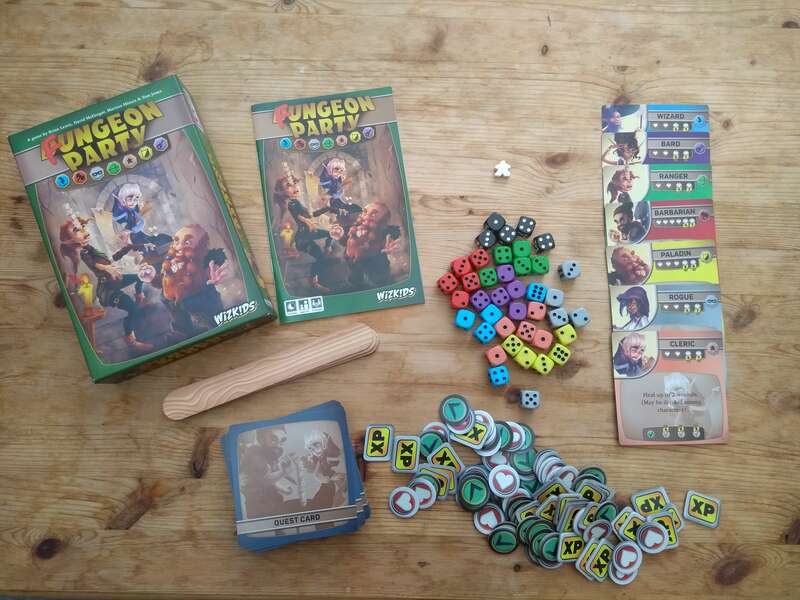 A copy of Fungeon Party was provided for review purposes. You can find out more about Fungeon Party on the website of publisher WizKids.